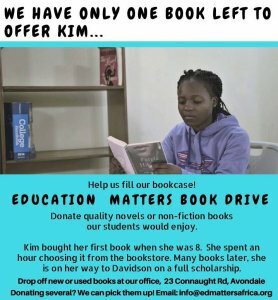 Education Matters is a non-profit organization registered as a trust in the Republic of Zimbabwe. We appreciate your generous donations and support of our work. You can make a tax-deductible donation to our USAP Access Funds via our Global Giving campaign to build the USAP Community School using the button to the right and in the footer of this webpage. You can use the Donate button below which processes payments through Paynow. Payment methods accepted are Visa, Mastercard, Ecocash, Telecash and ZimSwitch. Donations can also be made to Education Matters via EcoCash using the merchant code 20316. We continue to source for novels, biographies and other current books of interest for our students to read between A level and university. We also are in constant need of non-perishable snacks (coffee/tea/boxed milk, Mazoe, maputi, biscuits, chips, etc) to offer students who come in for full days to work on applications.